Yacht Basin Marina in Holland originally was developed as Bay Haven Marina in the 1950s. It assumed its present name in 1990, when the marina passed to new ownership. Yacht Basin is a full-service marina with 371 boat slips, 140 In/Out racks, a ship store, and winter outdoor and indoor heated boat storage. Winter storage is a particularly important part of the business, given the region’s relatively short summer season; heated buildings enable owners and staff to work on boats during the colder months. 2016 marks Yacht Basin’s first year competing in the Michigan Battle of the Buildings energy reduction competition. The marinas’ building 2 earned second place in the Warehouse & Distribution category, with a weather-normalized energy reduction of 9.15 percent. Much of Yacht Basin’s decrease in energy use can be attributed to a series of small but important procedural changes, including scheduling regular heating equipment maintenance, as well as making sure large doors are opened less frequently and entry doors are not left propped open. “We completed a lighting project thanks to an energy rebate offered by the Holland Board of Public Works,” says Yacht Basin General Manager Matt DenHerder. He estimates the marina will see a savings of approximately $1,200 from implementing its energy reduction projects. Yacht Basin Marina’s single most important energy reduction measure involved the addition of a Building Management System (BMS), which enables staff to monitor and control the facility’s furnaces remotely. The new system makes it possible to manage energy usage more precisely than using simple thermostats. Yacht Basin’s furnaces previously were set to one temperature 24 hours per day. The new BMS makes it possible to manage temperatures in relation to the weather outside, the calendar and varying daily needs. “Building temperatures might need to be higher when boats are being painted,” DenHerder explains, “and lower during holiday periods when no owners are present. Yacht Basin is recognized as a Michigan Clean Marina, a voluntary state program that helps marina owners and customers reduce their impact on the environment. “We maintain as much green space as possible, and equipment purchases are always made with energy consumption in mind, DenHerder adds. DenHerder and his staff continue to explore all possible forms of energy reduction. “Our business depends on an environment with clean water and air, so it makes sense for us to help in every way possible,” he acknowledges. 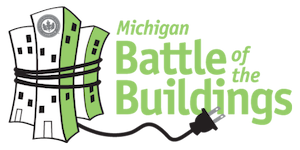 Yacht Basin Marina is already registered for, and looking forward to competing in, the 2017 Michigan Battle of the Buildings.